Whenever I’m at my son’s place in Montreal, the first few days go into cleaning his place. Out of all my three kids he’s probably the one with the most gadgets. Home cleaning becomes an easier task and love that our clothes do not have that awful damp smell. The wonders of a clothes dryer. His kitchen too is equipped with some of the best and powerful appliances. Every visit and we add a new gadget. This time round I was appalled at the state of our very useful pressure cooker. The bottom no longer sits well on the hob and I just don’t want to get you into the colour of the poor pressure cooker. So I insisted that we buy an Instant Pot as anyway I’d read so much about it and a few bloggers even use it regularly. In a small kitchen we need gadgets that are multi functional. So the Instant Pot fits that description. I would recommend an Instant Pot anytime. However, don’t think I’ll get one for my home in Mombasa because of the frequent power cuts and power fluctuations. However, here it works like a charm. I had put some tuvar dal on the slow cooker mode and gone to the market. When we got back home after 3 hours the dal was cooked. I cook rice in it frequently because its also a rice cooker. Saute some dry sabji or a sabji with gravy. No noisy whistles and the best think is that it does not generate heat like a hob, grill or oven does. You can steam stuff in it so next recipe to try is dokhra in the Instant Pot. Can put eggs to boil and don’t have to worry about water getting over. It all works on a timer. As soon as the time is over, the Instant Pot goes into the warm mode. The options are endless. I made some soup in the Instant Pot. It was ready within 15 minutes. Check out the recipe for a quick and filling soup. Add oil in the inner pot of the Instant Pot (IP). Switch it on to the saute mode. As soon as the oil becomes a little hot, add the chopped onions. Stir frequently and cook the onions till it becomes soft. Add the garlic. Stir and add potato cubes. Add salt and the water. Mix well. Close the lid of the IP. Turn the vent to the sealing position. Set the timer to 5 minutes manually. After the 5 minutes are over, cover the vent with a dish cloth. Move the vent to the venting position. Lift the vent gently using a long spoon or a knife.The steam will come out. Its best to use a dish cloth so that you don’t get burnt with the hot steam and it doesn’t create a mess. Set to the saute mode again. Add corn and milk and let it simmer for 5 minutes. Add cheese, pepper, spring onion and coriander. Mix well. Serve piping hot soup with some bread of your choice. If you are not going to serve the soup immediately, close the lid. It will stay hot for 10-15 minutes. Add any other veg of your choice. I mashed some of the cooked potatoes to make the soup base a bit thicker. You can add ¼ cup cream if you want to. Soups are always so comforting, especially in rainy or cold weather. Soup looks so creamy and delicious. Is this pot something like rice cooker? Superb share. Congratulations on the new Instant Pot MayuriDi! 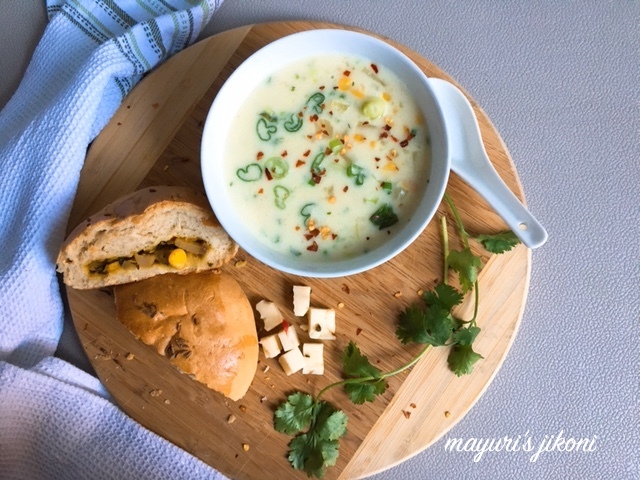 This creamy potato corn soup with cheddar looks very tempting in this weather. The soup is so creamy and looks lip smacking!Delicious with bread! The soup looks absolutely delicious! I love these creamy soups.. My daughter-in-law also makes them with variations. Isn't the instant pot amazing? I love the way you have made the delicioussoup using all it's functions!! No wonder so many of my American friends take it on their motoring holidays as they can cook something quick in their hotel rooms!! What filling have you used in your rolls? They look amazing too! I love all your mouthwatering photos, the recipe looks great and I like the fact that its so easy nad quick to cook in the instapot. Thanks Sujata. Instant Pot is like a pressure cooker without the noise. It works like a rice cooker too and has so many other functions like you can saute, boil, steam and also use it as a slow cooker. Yes, Pushpita its like getting a new toy but sadly will have to leave it in Montreal as we have too much power fluctuations in Mombasa. Thanks, the soup did turn out creamy. Thanks Veena, I mashed some of the potato cubes to make it thick. It is Mallika… you should get one. I love it and thanks. I love them too Shobha and they are filling. Thanks Mina.. as the theme was fireless cooking, I thought of getting to know my instant pot more;) I stuffed the rolls with potato, peas, carrot, onion and coriander stuffing… the kind we make for masala sandwich or samosa stuffing. Nayna I too was really amazed at how quickly the soup got ready…but not telling my family as then they'll want me to cook something even on days I am tired especially after an outing. Soup is perfect for the wet weather here and my bad throat too.Wonderful share. Tempted to buy an Instant pot now.